Excellent performance whilst braking and cornering. Its specific compound – combined with the symmetrical tread pattern and wide shoulder blocks – ensure safety, comfort and stability. Designed to adapt to different driving conditions, it reduces the risk of aquaplaning. The profile is designed to reduce deformation in the critical areas and to improve the distribution of pressure in the contact patch. In this way the qualities of the tyre remain constant for its entire life. Many manufacturers have chosen P6 to equip their cars and it has won awards for its performance in various tests organised by the most authoritative international magazines in the sector. P6 has been developed for high class saloons, estate cars and MPVs where ride comfort, stress resistance, low rolling resistance, smooth running and evenness of wear are its distinctive qualities. 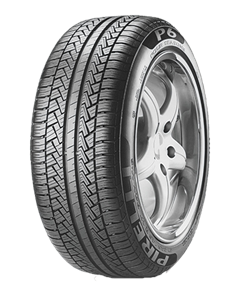 P6 retains the same designation as its founder father, introduced in 1977 as the first HP low-profile radial tyre. The new P6 is the result of the innovative STEP (Safety from Technically Engineered Profile) platform, through which the Company decided to respond to the new demands of high performance motoring. The STEP project relates to the new tyre profile designed to reduce deformation in the critical areas and better distribute pressures in the contact area. The cap and base compound reduces energy consumption resulting in increased integrity and reliability of the whole structure. The impression at the wheel is one of great fluidity and of control, with a high degree of adaptability to variable driving conditions. In particular, the safety advantages are substantial: greater aquaplaning resistance, more grip and braking stability in the wet and dry, qualities which remain constant throughout the tyre's life. Sorry, we currently do not have any tyres with the P6 pattern in stock.